Donald E. Zender, 59, of Prefield, died Thursday, Sept. 4 (1997), in Lehigh Valley Hospital in Salisbury Township. He was a financial adviser for First Union National Bank iin Allentown. 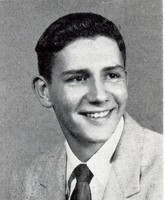 Born Aug. 23, 1938, in Easton, he was a son of the late Donald E. and Dorthea Davenport Zehnder. He and his wife, the former Karen DiNapoli, observed their third wedding anniversary in February. In addition to his wife, he is survived by a son, Gregory of Emmaus; a stepson, Michael Pellegrino of Leesburg, Va.; two daughters, Jill Ilagan of Morristown, N.J., and RaeAnn DeNardo of Easton; three stepdaughters, Danielle Pellegrino of East Stroudsburg, Pa., and Samantha Sontag and Amanda Sontag, both of Orefield; and three grandchildren. Srevices will be held at 9:15 a.m. Monday from Kohut Funeral Home, 950 N. Front St., Allentown. A Mass of Christian Burial will be celebrated at 10 a.m. in St. Joseph the Worker Catholic Church in Orefield. Call 2 to 4 p.m. and 7 to 9 p.m. Sunday in the funeral home.